For my penultimate project for my Core Studio 3D and Core Seminar 3D class, I was tasked with creating a maquette or set design depicting a scene of my own choosing. 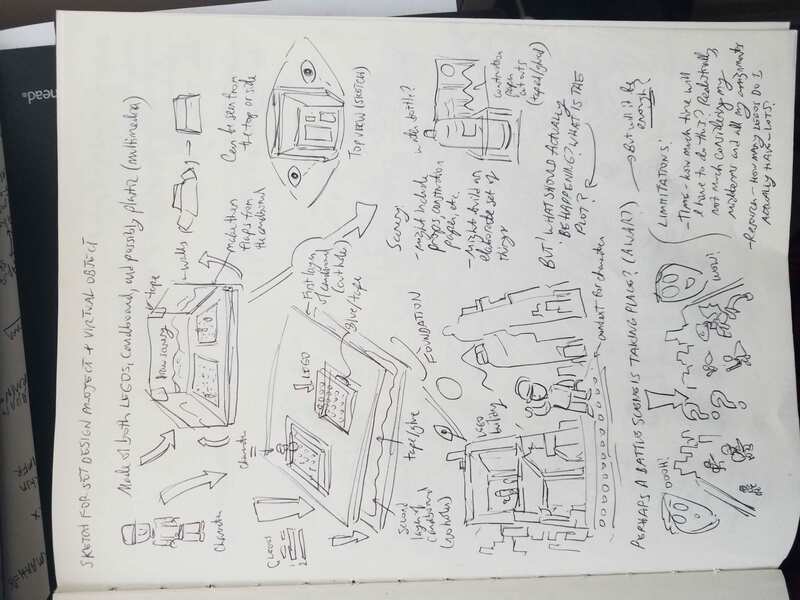 I initially had no idea what I was going to do conceptually for the project, although I did have a solid plan for what materials I was going to use, as my sketch shows. 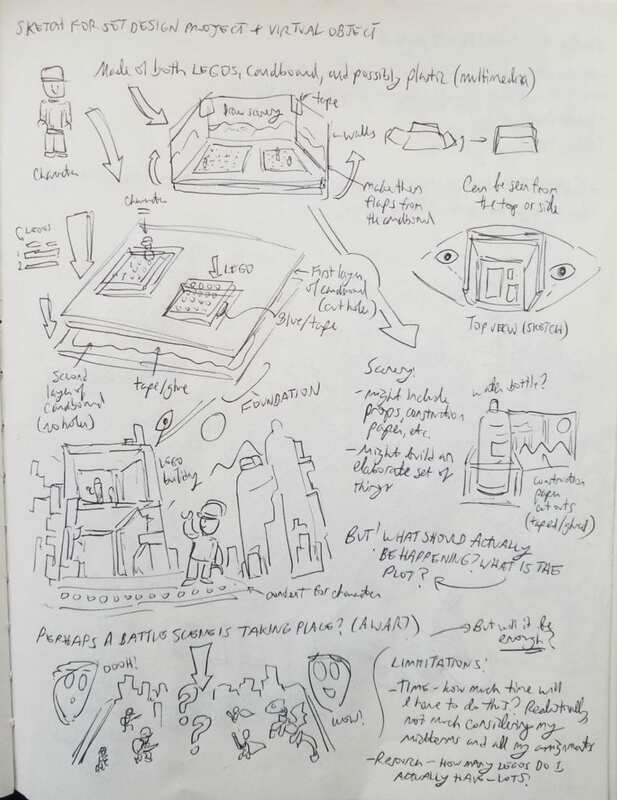 My first initial sketches pointed me towards creating a tropical archipelago of many different islands, and some vague conflict going in this scenario. 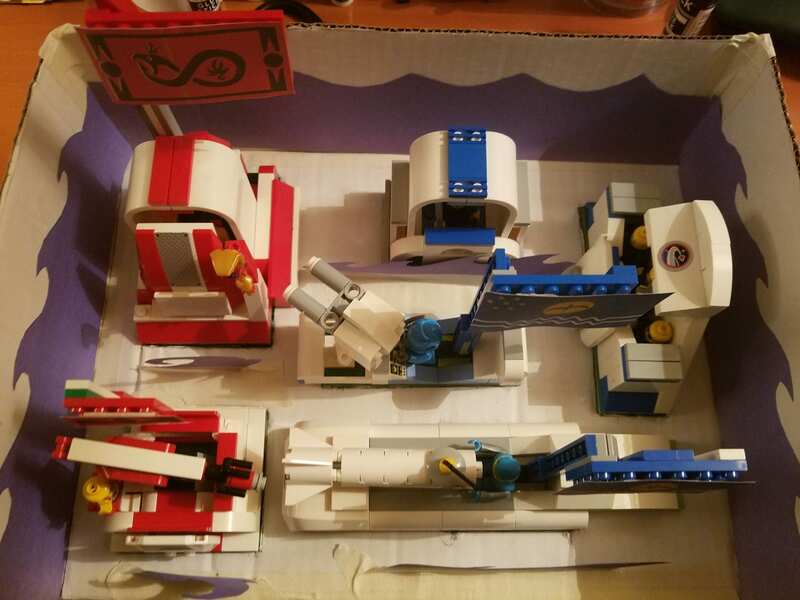 I took two layers of cutout cardboard (the base) and cut several large rectangular holes in the top layer just big enough to fit LEGO tiles and pieces of the exact size needed (I used the LEGO pieces to trace the rectangular holes in the first place). Then, for the walls of the set, I took two smaller cardboard cutout pieces and taped them the edges of the base, then taped them to each other, forming a robust structure. Following this, I glued both layers of the base together, leaving rectangular depressions where the top layer holes where. I then took my green LEGO pieces (which served as the “islands” of this set), stuck tape to the bottom of the pieces, and pressed down on the bottom second layer of the set as I placed the LEGOs to snugly fit into the holes of the first layer. Those LEGOs would not be going anywhere. 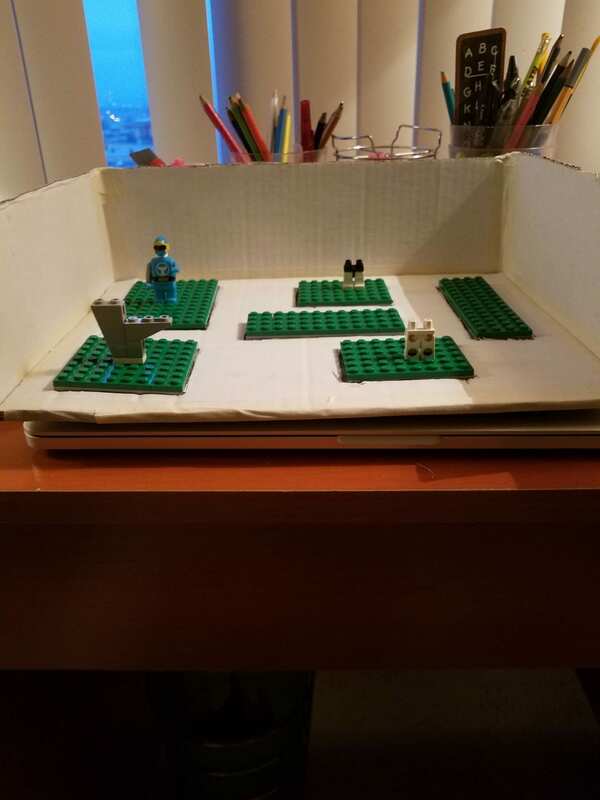 The result was the first two photos you see above (Set Design Front, and Set Design Top View Initial Model). 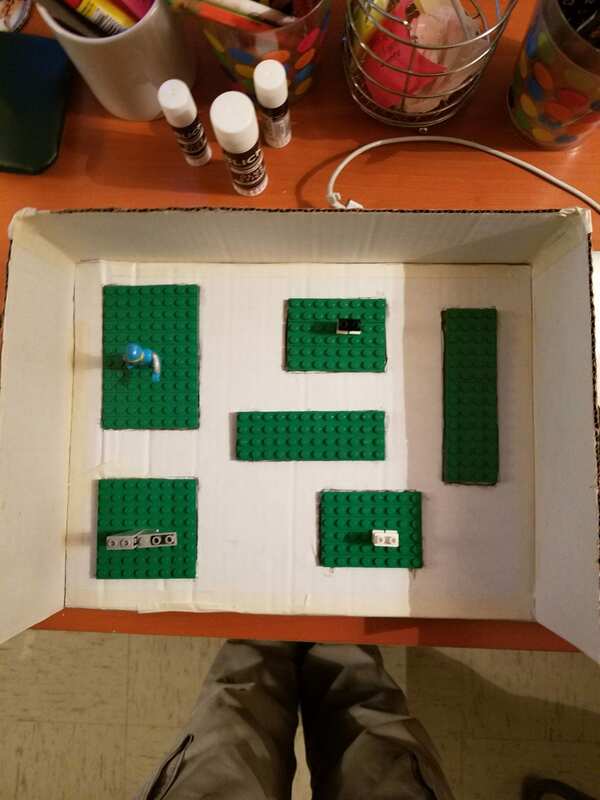 After getting the initial “skeleton” of the model done, I spent the better part of my Thanksgiving break experimenting and playing around with LEGOs and putting LEGO people in the set. A story eventually arose in the process of me building structures on top of these “islands”, which by the end of my building process started to look more like boats or rafts floating on the ocean (see the last two photos showing the final 3D model) in the middle of a battle for supremacy. The story is this: In a future Earth beset by drastic climate change, most of the world’s landmasses have gone underwater due to rising sea levels. Now, the last remaining humans fight for the little resources left in the world on hastily made rafts and boats coming from countries turned into islands and archipelagos. Pirates and rogue factions sail the high seas, and petty kingdoms, micronations, and Empires arise from artificial islands, or mobile ships and rafts from which kings and emperors rule (this is also a satire on contemporary geopolitics and its triviality). The future looks bleak for humanity, sadly– things can only get worse as less and less resources are available for people to consume. Following the creation of my story, given its climatological themes, I added blue construction paper to the walls of my maquette, and cut out blue wave like forms from that same paper, and taped it upright to the floor of the set to simulate rushing tides and flooding water. 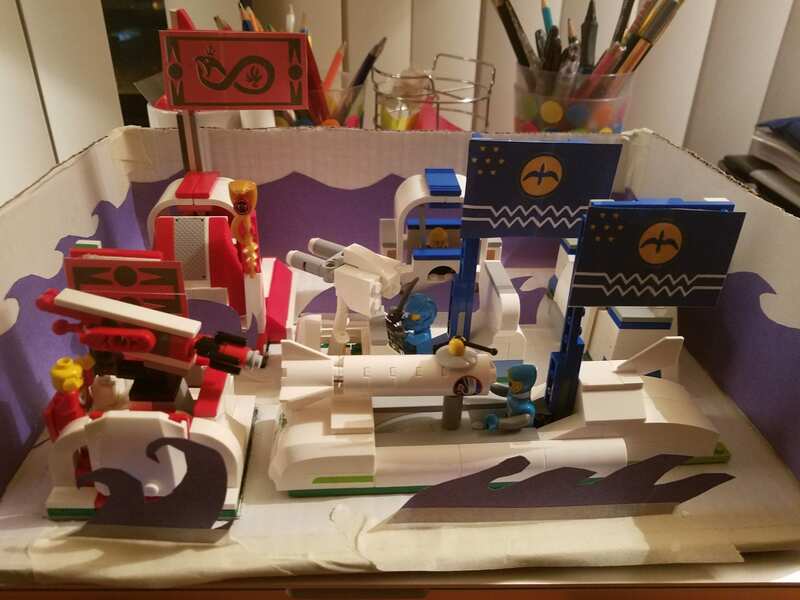 My final step to the completion of my set was adding designs for flags to be placed over the rafts and ships of this scene of conflict. I also already had flag like structures made out of LEGOs that I felt needed to be covered. Thus, I quickly went on Illustrator and created flags to be cut out and placed over the respective “micronations” of my set. I created a generic “Empire” flag for the red and white boats and rafts to the left, and a generic European Union inspired “democratic” flag for the blue boats and rafts to the left. 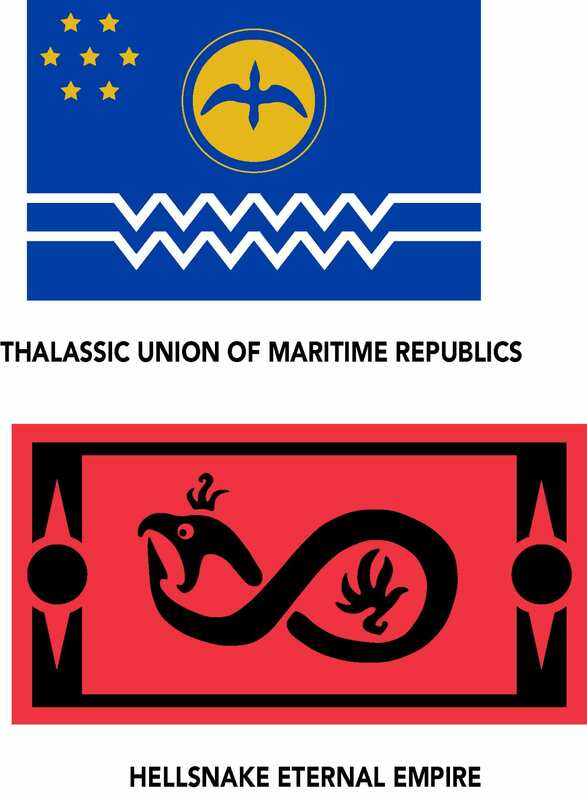 The Thalassic Union of Maritime Republics (TUOMR or TUMR) is composed of six island states and have an albatross’s silhouette over the rising Sun and the ocean as their symbol. An albatross is a seafaring bird. By contrast, the Hellsnake Eternal Empire has menacing red and black colors to strike fear in the hearts of the country’s opponents. It is an imperialistic, militaristic nation-state that arrogantly claims it will last forever with the subtle infinity symbol at its center, made by the snake eating its own tail (similar to an ouroboros). However, to Hellsnake’s opponents, this symbol is really one of self-defeat and self-destruction (the snake will devour itself eventually), which casts a shadow of embarrassment upon this would-be glorious Empire. Hellsnake is supposed to be a parody of an imperialistic regime that in reality is about as irrelevant and ineffective and doomed as all the other nations on this future Earth.